Democratic candidate Kyrsten Sinema and Republican Martha McShifty. A new Gravis Marketing poll finds Democrat Kyrsten Sinema in a dead heat with Republican Martha McShifty in the race for US Senate and — good news — Democrat candidate for Governor David Garcia is within 4 points of Republican Doug Ducey where the margin of error is 3.3 points. Gravis, a nonpartisan research firm, conducted a random survey of 882 registered, likely voters in Arizona from Sept. 5-7. It found that Trump is very unpopular, with 47% saying they “strongly disapprove” of his job performance. This could become important because McSally has snuggled up close to Trump. 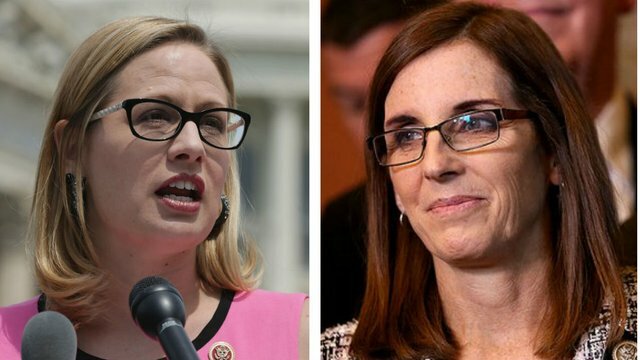 The entire nation is watching the Arizona race for US Senate, which has been marked by stupid, false and nasty attack ads by McSally. See McSally ad lies to denigrate the First Amendment rights of Americans. US Congress member Sinema supports full access to healthcare. “We need to fix the parts of the system that are broken while protecting the things that are working — like ensuring coverage for the 2.8 million Arizonans with pre-existing conditions. We need to protect Medicare, Kids Care, and AHCCCS — critical programs that Arizonans count on for affordable, quality care. We need to fight back against misguided proposals like an “age tax” that would force Arizona seniors to pay up to five times more for their care,” she says on Tucson.com. Sinema also supports improving health care for veterans, funding military bases in Arizona, citizenship for Dreamers and protecting federal funding for Arizona public schools. McSally voted against Obamacare, for raising premiums for seniors and for abolishing coverage of pre-existing conditions. Ducey is not a popular governor, with 1/3 of Republicans voting against him in the primary. 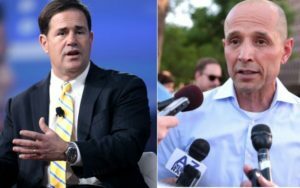 According to Gravis Marketing, 48% of voters would vote for Ducey if the election were held today, compared with 44% for Garcia. Again, the margin of error is 3.3%. See With AZ Ranked Badly by Many Measures, Democrats Can Beat Governor Ducey. But the race will be close. Garcia has been the target of racist ads. “Racially motivated attack ads are pretty much dog whistles but now we’re seeing bullhorns,” Roy Tatem, president of the East Valley NAACP, told Tucson News Now. Tatem is referring to a 30-second spot — paid for by the Republican Governors Association — that features the mother of a blonde, white family telling voters that David Garcia is unsafe for Arizona. Garcia – a veteran, Ph.D. holder and ASU professor — aims to fully fund public education in Arizona. Ducey, an ice cream salesman, is a creature of the Koch brothers and has signed laws to hide dark money in Arizona elections and to gut public education in the state. Republican Kimberly Yee is ahead with 49% of voters favoring her over Democrat Mark Manoil with 38% in the race for State Treasurer. 50% of Arizona voters oppose the ability to obtain an abortion and 32% are in favor of it, with 18% uncertain. 52% support laws to prevent discrimination against LGBTQ individuals and 23% oppose it, with 25% uncertain. 46% believe that the investigation is justified into Trump’s dealings with Russia led by Robert Mueller, and 44% say it’s politically motivated. 10% are uncertain. 50% approve of Mueller’s job performance, 34% disapprove and 16 percent are uncertain. 48% disapprove of building a border wall on the Mexico border, 45% approve and 7% are uncertain.